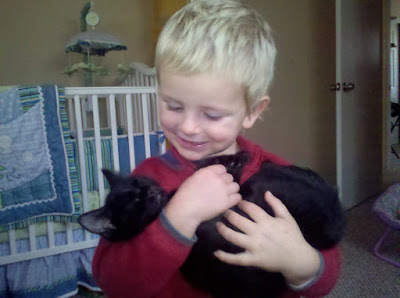 A boy & his kitten. Dillon has been doing all things one handed for the past few days. He goes to the bathroom, eats and even plays the keyboard one handed, so that he may keep a hold of his precious kitten Twilight in the other. One morning I did have to spoon feed the almost four year old, because eating one handed was just not working out so well.